We’ve had a few support tickets from people asking how to add their company logo to Purchase Orders in SpendMap. 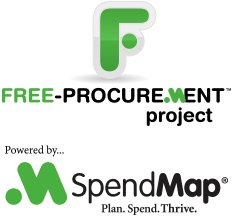 You will be prompted to select your logo during the Setup Wizard that runs automatically when you log into the Live Copy of SpendMap for the first time. On that screen, click the link “Select my company logo”, and you’ll be prompted to upload an image file (JPG, GIF or BMP file). Marsha works at a shipyard in Newfoundland, Canada, and was asking if she can enter her PO numbers manually, instead of SpendMap assigning the next Purchase Order number automatically for each new order. Sure thing Marsha, you can enter your PO numbers manually on each new PO if you prefer. you can set up multiple “PO Number Sets”, and one of the Number Sets can give you the next sequential number for each new PO, and you can use a separate PO Number Set that allows you to enter the PO numbers manually for certain orders when you need to. If you want to enter your PO number manually, just enter “.” (a period, without the quotes) in the Next Number field, then select the check-box to “Allow user to modify number”. On some printers, Purchase Order forms were printing with no top and left margins, making the form appear off-center. You can correct this simply by selecting the menu HELP > CHECK FOR UPDATES in SpendMap. When using the “Testing Copy” of SpendMap, which allows you to make a copy of your Live System for testing purposes, sometimes the copying procedure would fail with the message “Unable to delete files in ROOT folder”, after which the icon/shortcut to run the Testing Copy would fail to launch. Unfortunately, if you experienced this issue, you will not be able to log into your Testing Copy to check for updates, so just submit a support ticket or send us an e-mail at free-procurement@spendmap.com and we’ll reply back with instructions for correcting the problem. However, if you are able to log into your Testing Copy, please do so (without refreshing the data from your Live Copy) and select the menu HELP > CHECK FOR UPDATES, to avoid the issue going forward. An update has been posted to correct an issue in the free version of SpendMap whereby an “unregistered copy” watermark would print on Purchase Orders and other documents if the system was copied or moved to a different computer or restored from backup. To correct this issue, just select the menu HELP > CHECK FOR UPDATES from within SpendMap to update your system. If you have any questions, please use the free support ticket system. We still see it from time to time; the 13-digit PO number. You know, first you take an incrementing PO number, then you jam the date at the front, stick on the cost center or job number, and maybe sprinkle in the Buyer’s initials for good measure. If you’re coming from a manual, paper-based process to manage your Purchase Orders, you wouldn’t be the only one to use your PO numbers for purposes other than identifying the order. After all, when all you have to rely on to track your spending history is a filing cabinet, what other alternatives are there?